Italian Gold & Diamond address, phone, website, and more. 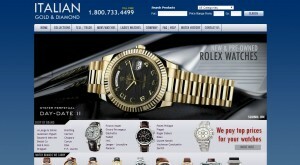 Italian Gold and Diamond was established in 1986 as a leading wholesale of luxury watches and fine jewelry. Italian Gold & Diamond maintains a large inventory of lab certified diamonds and offers the finest of quality jewelry designs. Our extensive collection of new and pre-owned original watches includes Rolex and other top Swiss Brands such as Patek Philippe, Brequet, Cartier and many more. All watches pass stringent inspection for quality and authencity and come with a one year warranty. We are able to locate luxury time pieces at a substantial discount for demanding celebrities and collectors like Sir Elton John, Harry Connich Jn., Aaron Neville, Jacqueline Smith, Usher, Paula Abdul, Chef Emeril and many more. We use our international network of authorized watch dealers to buy fine timepieces at a great price and pass the savings to our customers.